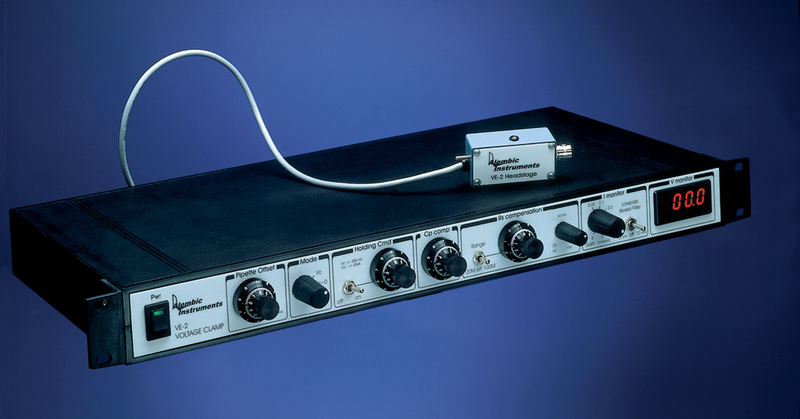 Alembic Instrument's VE-2 Whole-Cell Patch Clamp Amplifier. For the fastest, largest ionic currents, you need the VE-2. and eliminates series resistance errors. Voltage clamp the largest, fastest whole-cell currents under physiologic conditions. Super stability gives super ease-of-use. Just 2 controls quickly and easily sets compensation. Familiar IV converter architecture has all the features you expect. 100% Rs Compensation is possible. Standard amplifiers can only compensate ~90% of series resistance (Rs). In demanding applications, Rs voltage errors of only a few milivolts cause uncontrolled current activation and loss of the voltage clamp. (Eg.Ina in Neurons or cardiac myocytes). But become unstable when pushed too far (B). Cell voltage during a membrane ionic current pulse using 90 % (A), and 97 % (B) Rs compensation found on other amplifiers. The voltage error is reduced to 5mV (B) but undampened oscillations indicate instability. Rs=10 MOhm, Cm=50pF, Ipulse=20nA, Bandwidth=50kHz. The VE-2 Solution Gives the VE-2 Advantage. Only the VE-2 compensates it all. Only the VE-2 can compensate fully for Rs (C) (Sherman et. al., Biophys. J., 77:2590-2601, 1999.). There is no voltage error after ~200 µs in every cell you voltage-clamp, regardless of the current amplitude. The VE-2 is stable even when over compensated. Cell voltage during a membrane ionic current pulse using VE-2 Rs compensation, showing no voltage error after ~ 200 µs. Record currents that were out of reach until now. Record from the largest cells.